We invite you to join us at the Sheraton Grand in Chicago, IL for this exclusive Advisor Summit. 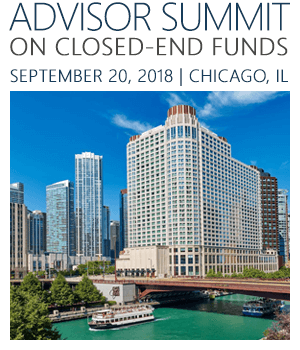 This event offers advisors the chance to hear from closed-end fund industry experts and portfolio managers, exchange ideas, and obtain the latest information on a variety of areas and topics related to CEFs. Speaker presentations and candid discussions will focus on understanding, analyzing, and using closed-end funds to generate income.